I bought this Calla Lily last year at a Lowes garden center. 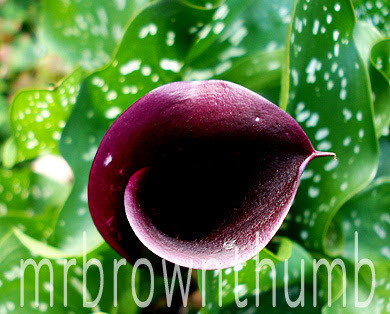 When I walked into the garden center my eyes were immediately drawn to a display of black Calla Lilies that were labeled 'Hot Chocolate' and I picked one up. I'd been purchasing all the black flowers I could find last year for the black and green theme I want to develop in my garden. When I got home I took a closer look at the tag and noticed it was labeled Zantedeschia 'Blackjack.' Out of the huge display I managed to pick up the one that wasn't labeled 'Hot Chocolate' but I'm still pretty happy with it. On second thought, I am more than happy with this bloom- I am ecstatic! The plant tag describes the bloom color as a "deep purple-black" and it's close enough to black for my tastes. I have this plant growing in a pot so that I can hide it among other plants because I'm worried that someone will come into the garden and take it. If I'm not mistaken you can't reproduce these from seed, they have to be propagated by offsets or tissue culture to reproduce the color. That is a nice looking Calla. When I was at Highgrove House in England last year they had an area where the Prince eats breakfast that was planted with all black and deep red flowers and foliage. It was quite striking. They only black flowers I grow are some bearded Iris I got from Weston Nurseries awhile back. :lol: Last week I was speaking to a customer and they said they wanted some Canna Lilies, after telling her all about them and deciding to get some I finally figured out she meant Calla lilies. Lucky it was before I went shopping. The color on this calla is stunning. I was going to buy some colored callas this year but I never got around to it. After seeing this photo, I am definitely going to. That sounds pretty cool. Did you happen to take pictures of the area with the black flowers? I know what you mean. When I first joined GardenWeb I had the hardest time figuring out what people meant by "Canna Lilies." You should I like the colored ones because nobody around me seems to be growing them. I bought the same Calla, for the same reason! I thought it absolutely striking. Not nowing a great deal about plants in general, I bought the Calla as a houseplant. It looks great on my kitchen window sil. Unfortunately the flowers are now wilting and dying. Should I be 'dead heading' these or cutting them back....... I haven't a clue abd don't want to spoil this beatiful plant. Please help!